The board shall consist of a chairperson and four district commissioners. The four district commissioners shall be residents of their respective commissioner districts. The chairperson shall be elected at large. 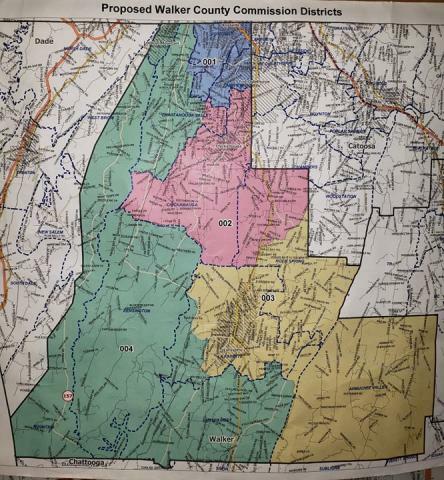 Walker County shall be divided into four commissioner districts. One member of the board shall be elected from each such district. Commissioner Districts 1, 2, 3, and 4 shall correspond to those four numbered districts described in the map below. continue to reside in that district during that person's term of office or that office shall become vacant. The chairperson of the board shall be 25 years of age or older, shall have resided in Walker County for at least 12 consecutive months prior to election to such office, may reside anywhere within Walker County. The chairperson shall continue to reside within Walker County during that person's term of office or that office shall become vacant. The first members of the Board of Commissioners of Walker County shall be elected at the 2020 November general election. The members of the board elected from Commissioner Districts 1 and 2 in 2020 shall take office on January 1, 2021, and shall serve for an initial term of office which shall expire on January 1, 2023, and upon the election and qualification of their respective successors. The chairperson and the members of the board elected from Commissioner Districts 3 and 4 in 2020 shall take office on January 1, 2021, and shall serve for initial terms of office which shall expire on January 1, 2025, and upon the election and qualification of their respective successors. All future successors to the chairperson and members of the board whose terms of office are to expire shall be elected at the November state-wide general election immediately preceding the expiration of such terms, shall take office on the first day of January immediately following that election, and shall serve for terms of office of four years and until their respective successors are elected and qualified.